Trakai is a historic city and lake resort in Lithuania. It lies 28 kilometers west of the capital Vilnius. The name of the town firstly was recorded in 1337 chronicles in German as Tracken and is derived from the Lithuanian word trakai (glade). Since the time of the Polish–Lithuanian Commonwealth, the city was known as Troki in Polish. The majority of Trakai’s inhabitants are Lithuanian, but in Trakai also live Poles, Russians, Belarusians and Karaims. According to a legend, after a successful hunting party, Grand Duke Gediminas discovered a beautiful lake-surrounded place and decided to build a castle in the location. 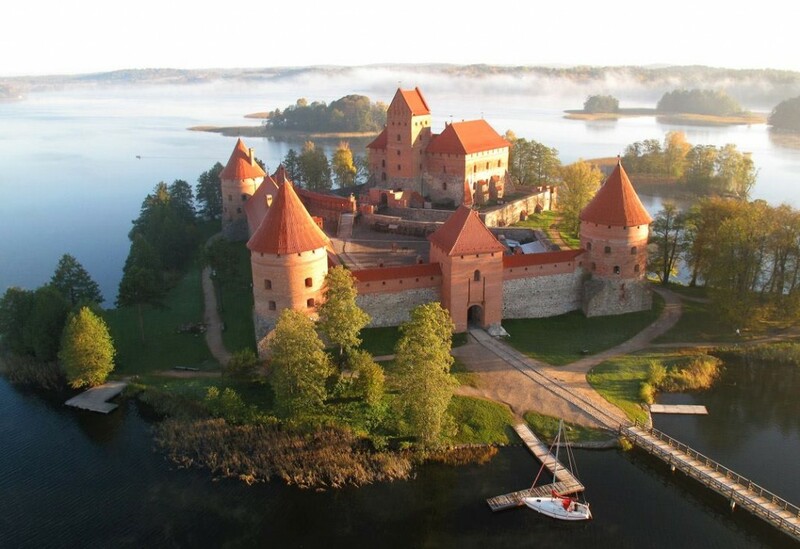 Son of the Gediminas – Grand Duke Kęstutis has built some new castles: a new castle was built in the strait between lakes Galvė and Luka (Peninsula Castle), and another one, on an island in Lake Galvė (Island Castle). A village grew around these castles. Next Grand Duke Vytautas replaced the older, wooden fortress with a stone-built castle in early 15th century. Trakai became a political and an administrative centre of the Duchy and sometimes named a de facto capital of Lithuania, because of the fact, that Vytautas spent more time in Trakai then in Vilnius (official capital). In addition, in 1409, the town was granted with Magdeburg Rights; it one of the first towns in Lithuania to get city rights. During the wars between Russia and Polish–Lithuanian Commonwealth in 17th century, the town was plundered and burnt, both castles were demolished and the town’s prosperity ended. 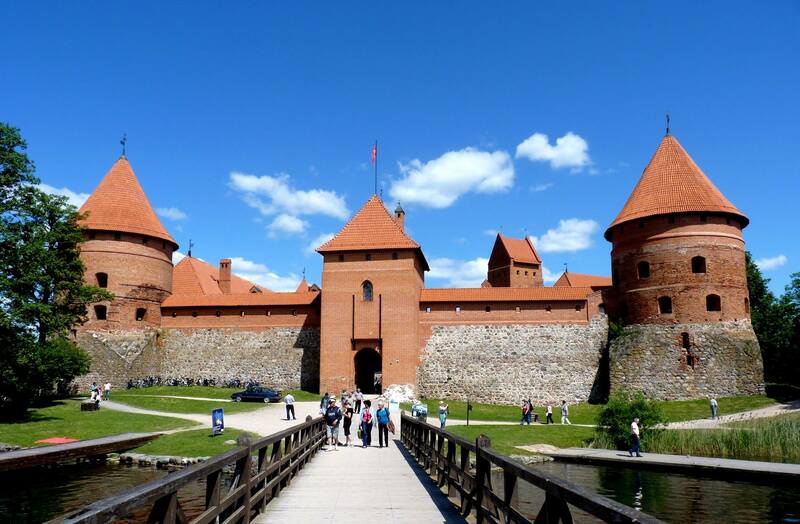 The Trakai Island castle was restored only in 20th century and now it serves as the main tourist attraction, hosting various cultural events such as operas and concerts. Interesting fact is that the Trakai has a significant Karaim population. Karaims are a small Turkic-speaking religious and ethnic group resettled to Trakai by Grand Duke Vytautas in 1398 from Crimea. Karaim religion is Karaite Judaism. 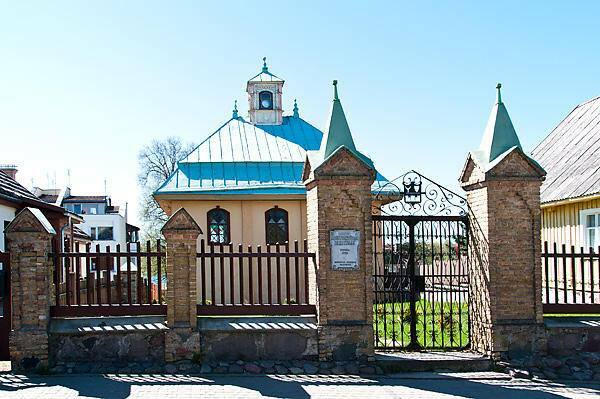 During all the next centuries, Trakai remained a notable center of Karaim cultural and religious life. Trakai’s Karaim kenesa is a rare example of a surviving wooden synagogue with an interior dome. 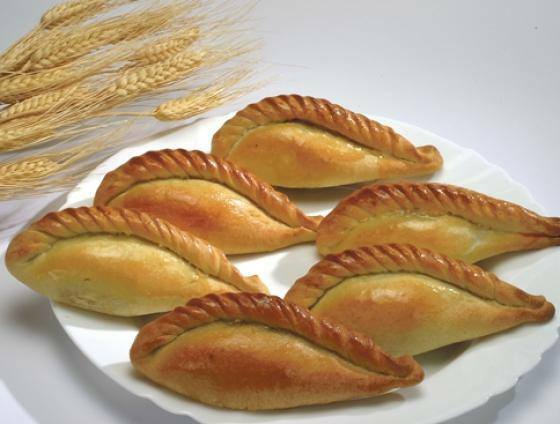 Kibinai, traditional Karaim pastry, became a local specialty and are mentioned in all the tourist guides.